Significant percentage of maxillofacial trauma patients are encountered nowadays worldwide, and hence necessary investigations are of paramount importance. Of all the maxillofacial bones, mandible is more prone and commonly encounters fracture. Knowledge of the fracture pattern and the etiology of the injury is important for the management of maxillofacial fractures. According to the cause of trauma, mandible has unique characteristic features in terms of age and gender distribution, as well as the site and severity of fractures. Many times, these fractures go undetected, if not examined properly. For initial diagnosis and proper treatment plan of facial injuries, diagnostic images play a crucial role in providing necessary information. It has been well documented that panoramic radiographs provide diagnostic accuracy in detecting mandibular fractures. However, in diagnosing fractures of middle facial region, it proves to be an inadequate modality. Despite various specialized imaging modalities being available, most researchers still prefer panoramic radiographs over other extraoral radiograph for mandibular fractures. Advanced digital imaging modalities are an alternative to conventional film-based radiography. Diagnostic imaging in dentistry is mainly based on computer-based methods because of rapidly emerging direct and indirect digital imaging systems. With the help of this technology, image manipulation, such as conversion of film-based radiographs to digitized images, can be done. Radiographic interpretation in digitized image can be enhanced by altering the brightness, contrast, colorization, or application of inversion effects to radiographs, which are advantageous in compensating visual limitation of human observers and for task-dependent routines for specific diagnostic questions. Previous studies have shown an ambiguous result pertaining to the application of inversion effect to images. Black background permits optimal image contrast for dark objects, and the examiners can adjust the images according to their preferences using computed programs. According to Paul et al., reversal of the original image allows enhancement of contours and makes the image more easily recognized by human visual system. Thus, undisplaced mandibular fracture is clearly visible after inversion effects are applied to radiographs. Studies concerning digitized panoramic radiographs with a view to improve the imaging of maxillofacial trauma radiographs are deficient in the literature. Hence, we conducted a study to explore this simple and inexpensive procedure for analysis of the mandibular fractures and to evaluate the diagnostic agreement of direct digital panoramic radiographs and inverted panoramic radiographs in the detection of the mandibular fractures. To study the diagnostic agreement of the radiographic interpretation, three calibrated examiners read the radiographs twice on two different occasions, independently and under blind conditions, to verify intraexaminer agreement. Only if the intraexaminer agreement was good, we estimated interexaminer agreement. If the examiners did not agree with themselves, they could not agree with someone else. Fifty orthopantomographs were collected from the archives of maxillofacial radiology. 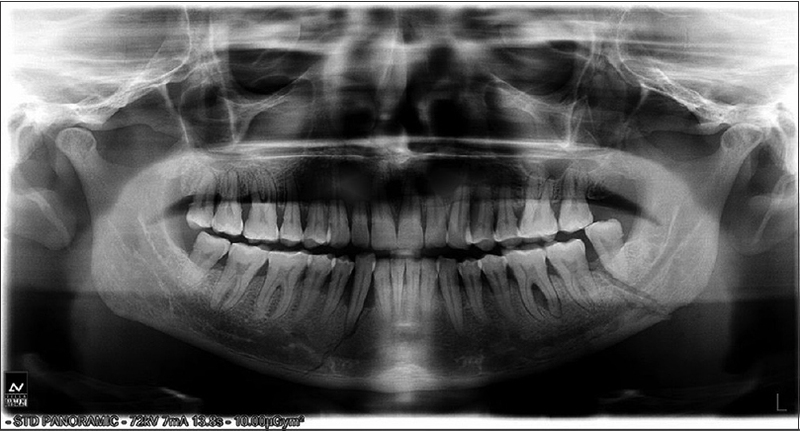 These radiographs included maxillofacial fractures of varying degrees. High quality radiographs with maximum sharpness, ideal contrast and density were only included, which were made using a digital OPG machine. 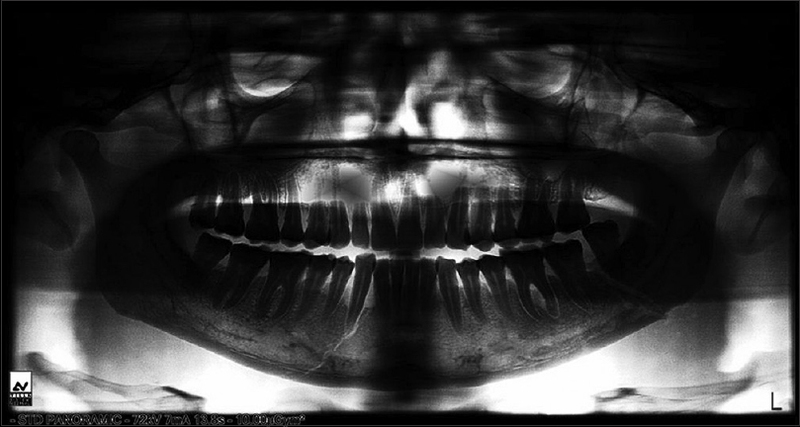 Inversion of the digital images was done using Dental Studio software. Both the conventional and inverted images were saved as.jpeg files. The presence of a radiolucent line in conventional digital radiographs [Figure 1] and radiopaque line in inverted digital image [Figure 2], which depicted the fracture line, were classified according to a three-point confidence scale. Fracture line very clearly seen. Both conventional radiographs as well as inverted images were evaluated by three expert oral radiologists twice with an interval of 10 days to check for interexaminer and intraexaminer variations. All the images were given a code, which was not known to the all the three examiners to eliminate observer bias. Images were displayed on a 15 inch and 24-bit video monitor (Dell Inspiron 15R) at a zoom of 100% using Microsoft picture manager. For all the examiners, the screen was placed at an optimum distance of 60 cm or 2 feet in a silent, isolated room to prevent distraction, and the room light was maintained dim to prevent extraneous light to reach retina. Monitor resolution was kept constant for all the images at 1024 × 786 pixels. Once the evaluation was done, all the scores were tabulated and sent for statistical analysis. Interexaminer as well as intraexaminer agreement was calculated by kappa statistics by point (κ). [Table 1] showed κ values for intraobserver assessment of the mandibular fracture and displacement of fracture lines in both direct digital panoramic radiograph (DDPR) and inverted panoramic radiograph (IPR). Observer C showed substantial agreement for the mandibular fracture in both DDPR and IPR. Observer A showed a moderate agreement for mandibular fractures in DDPR, whereas in IPR a poor intraobserver agreement was seen. Further, observer B showed a fair agreement for mandibular fractures in DDPR, whereas in IPR a poor intra observer agreement was seen. Similarly, for the displacement of fracture line, observers B and C showed a substantial intraobserver agreement in both DDPR and IPR, whereas observer A showed a moderate intra observer agreement in both DDPR and IPR. [Table 2] shows κ values for interobserver assessment of the mandibular fracture and displacement of fracture lines in both direct DDPR and IPR. There was a fair agreement between observers A and B for the mandibular fracture in both DDPR and IPR. When B and C were assessed, there was fair agreement in DDPR and moderate agreement in IPR for the assessment of fracture line. Similarly, when C and A were assessed there was a fair agreement in both DDPR and IPR for the assessment of fracture line. Interobserver agreement for the displacement of fractured lines between observers A and B showed a moderate agreement in DDPR and fair agreement in IPR. When B vs. C, and C vs. A were assessed, there was poor agreement in DDPR and IPR, respectively, for the displacement of fracture lines. Fractures localized to dental and paradental structures of maxillofacial region present difficulties to the dentist. Most of the maxillofacial traumatic injuries involve the dentition alone up to 50% or both the dentitions, as well as the adjacent soft tissue up to 36%. Traumatic injury to the maxillofacial region requires early evaluations and proper treatment plan as they are emergency situations in dentistry. Prognosis of any case depends upon correct diagnosis and treatment done to the patient. Yet, practitioners in dentistry mainly depend on two-dimensional imaging modalities. Advances in digital imaging technology has substituted film-based radiographs in dentistry and have given new alternatives to detect maxillofacial fractures, with reduced radiation doses, as the sensors are more sensitive to radiation than film. Inversion gray scale mode has been used in general medicine and radiology for the detection of pulmonary lesions. It has the potential to increase the diagnostic accuracy as a slight change in the intensity of an image is best appreciated by the eye in dark regions as compared to light regions. There are few studies reported in literature on the evaluation of gray scale reversal for identification of pulmonary nodules. Studies conducted by Sheline et al., Diederick et al. and Lungren et al. proved that the use of the gray-scale inversion method has greater specificity than the traditional chest radiographs for lung nodule detection. However, MacMahon et al. found that, for a variety of radiographic findings including pneumothorax, interstitial disease, bone lesions, and pulmonary nodules, diagnostic accuracy was greater with standard digitized images than inverse-intensity images. Despite controversy among authors, many of the examiners prefer the use of inverse gray mode, however, diagnostic efficacy was inferior. In the present study, the intraobserver agreement for assessing mandibular fracture and fracture fragment displacement showed that observer C presented higher intraobserver agreement than the other two observers (A and B) in both DDPR and IPR. Observer A showed a moderate agreement for mandibular fractures in DDPR (P = 0.0001), whereas in IPR (P = 0.296) poor intraobserver agreement was seen; moreover, observer B showed fair agreement for mandibular fractures in DDPR (P = 0.008) whereas in IPR (P = 0.277) a poor intraobserver agreement was seen. Similarly, for the displacement of fracture line, observers B and C showed a substantial intraobserver agreement in both DDPR and IPR (P = 0.0001) whereas observer A showed a moderate intraobserver agreement in both DDPR and IPR (P = 0.0001). The interobserver agreement showed that there was a moderate agreement between observers B and C for the mandibular fracture in both IPR (P = 0.0001); for the displacement of fractured lines, moderate agreement was seen in DDPR between Observers A and B (P = 0.0001). Variations in the results observed by examiner C may be due to the individual characters such as emotional and visual features at the time of examination. Punhani et al. conducted a similar study for the assessment of fracture line using conventional and inverted imaging, and concluded that conventional panoramic radiography was more reliable than inverted digitized radiography for mandibular fracture detection; however, for fracture detection in mid face region, the inverted method was more reliable than conventional PNS radiographs. Sakakura et al. in their study stated that diagnostic agreement was low for the detection of mandibular canal and mental foramen in conventional and inverted scanned panoramic radiographs. Gulnara et al. measured periodontal bone loss using inverted and unprocessed digitized radiographs and concluded that both the imaging modalities were reliable and there was no significant difference in the diagnostic accuracy. In a similar study, Rafael et al. concluded that periodontal bone defect measurements on an inverted digital image were inferior to film based radiography and underestimated the amount of bone loss. In the present study, it was felt by observers that both the imaging modalities were reliable and there was no significant difference in the diagnostic accuracy for the identification of fracture. However, displacement of fractured fragment was clear on digital inverted panoramic images, and inversion helped to visualize fracture of the superimposed bones easily in bones black images. As the present study was based on intraobserver and interobserver agreement in the interpretation of two different radiographic methods, and because the agreement levels of an observer might change during radiographic interpretation at two different times, it was difficult to assess which observer was correct or which is the best method for interpretation. Further studies with computed tomography as the gold standard method of facture assessment should be used to compare different radiographs. Iida S, Kogo M, Sugiura T, Mima T, Matsuya T. Retrospective analysis of 1502 patients with facial fractures. Int J Oral Maxillofac Surg 2001;30:286-90. Fasola AO, Nyako EA, Obiechina AE, Arotiba JT. Trends in the characteristics of maxillofacial fractures in Nigeria. J Oral Maxillofac Surg 2003;61:1140-3. Ogundare BO, Bonnick A, Bayley N. Pattern of mandibular fractures in an urban major trauma center. J Oral Maxillofac Surg 2003;61:713-8. Moilanen A. Primary radiographic diagnosis of fractures in the mandible. Int J Oral Surg 1982;11:299-303. Van Der Stelt PF. Principles of digital imaging. Dent Clin North Am 2000;44:237-48. Sakakura CE, Loffredo LCM, Scaf G. Diagnostic agreement of conventional and inverted scanned panoramic radiographs in the detection of the mandibular canal and mental foramen. J Oral Implantol 2004;30:2-6. Blackwell H. Contrast thresholds of the human eye. J Opt Soc Am 1946;36:624-43. Scaf G, Sakakura CE, Kalil PF, Dearo de Morais JA, Loffred LC, Wenzel A. Comparison of simulated periodontal bone defect depth measured in digital radiographs in dedicated and non-dedicated software systems. Dentomaxillofac Radiol 2006;35:422-5. Paul F. Van Der Stelt. Filmless imaging: The uses of digital radiography in dental practice. JADA 2005;136:1379-87. Gassner R, Bosch R, Tuli T, Emshoff R. Prevalence of dental trauma in 6000 patients with facial injuries: Implications for prevention. Oral Surg Oral Med Oral Pathol Oral Radiol Endod 1999;87:27-33. White SC, Pharoah MJ. Oral radiology: Principles and interpretation. 5th ed. St. Louis, MO: Mosby; 2004. Baxes GA. Digital image processing: Principles and applications. New York, NY: Wiley; 1994. Sheline M, Brikman I, Epstein D, Mezrich J, Kundel H, Arenson R. The diagnosis of pulmonary nodules: Comparision between standard and inverse digitized images and conventional chest radiographs. Am J Roentgenol 1989;152:261-3. De Boo DW, Uffmann M, Bipat S, Boorsma EF, Scheerder MJ, Weber M, et al. Gray-scale reversal for the detection of pulmonary nodules on a PACS workstation. Am J Roentgenol 2011;197:1096-100. Lungren MP, Samei E, Barnhart H, McAdams HP, Leder RA, Christensen JD, et al. Gray-scale inversion radiographic display for the detection of pulmonary nodules on chest radiographs. Clin Imaging 2012;36:515-21. MacMahon H, Metz CE, Doi K, Kim T, Giger ML, Chan HP. Digital chest radiography: Effect on diagnostic accuracy of hard copy, conventional video, and reversed gray scale video display formats. Radiology 1988;168:669-73. Fraser RG, Breatnach E, Barnes GT. Digital radiography of the chest: Clinical experience with a prototype unit. Radiology 1983;148:1-5. Punhani N, Daniel JM. Conventional radiography and inverted digitized imaging in the detection of maxillofacial fractures. J Dent 2011;1:63-7. Scaf G, Morihisa O, Loffredo L De CM. Comparison between inverted and unprocessed digitized radiographic imaging in periodontal bone loss measurements. J Appl Oral Sci 2007;15:492-4. Rafael S de M, Morais-Camillo JA, Sakakura CE, Ferreira MG, Castro Monteiro Loffredo L, Scaf G. Measurements of simulated periodontal bone defects in inverted digital image and film-based radiograph: An in vitro study. Imaging Sci Dent 2012;42:243-7.